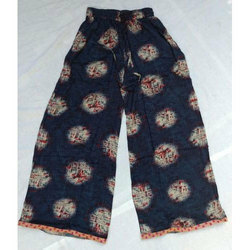 Providing you the best range of palazzo pants, hand block printed pants, cotton printed palazzo pants, dabu printed palazzo, rayon printed palazzo and ladies cotton pant with effective & timely delivery. 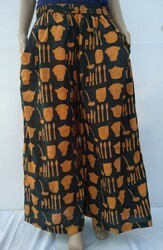 We are leading manufactuer of Palazzo Pants, we used cotton fabric its available in different sizes, also we prefere customization as per customer demand. We are supplying all over India. 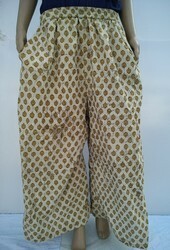 Backed by well qualified and experienced professionals, we are engaged in offering Rayon Printed Palazzo. 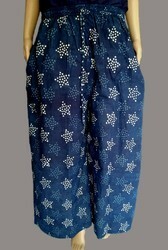 Designed in harmony with latest trends, it is known for its eco-friendly design. Available with us in various colors and designs, the quality of these products is never compromised at our end.